An Arab Woman Blues - Reflections in a sealed bottle...: Poverty in the New Iraq. It's always like that. I start off wanting to write about something quite important, but something of greater importance takes place and I have learned to get my priorities right in Life and my priority was and remains Iraq. Occupied, raped, destroyed Iraq remains a priority even more so, precisely because it is NOT getting coverage in either mainstream or "alternative" media. But this is another subject matter that I will have to delve into in greater depth in some future post, because this SILENCE around the Iraqi cause is criminal in itself. Let me not lose the thread of my thoughts here and knowing that most of you out there your attention span is that of 10 year old child, I shall keep it short and sweet. OK maybe not sweet...but as short and as dry as possible, just the way you like it. I shall present you with dry points- not that any amount of information will make a difference - still read the following, the latest from the "New" Iraq. 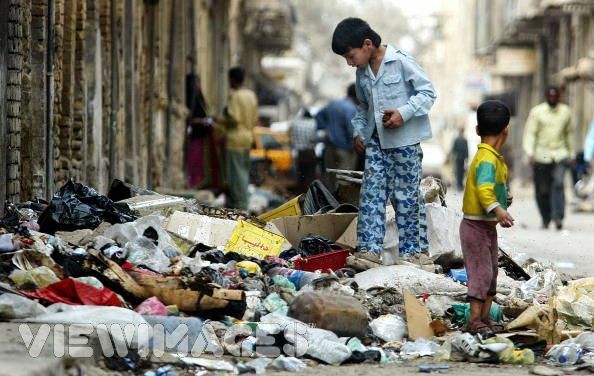 A study published by the University of Babel, came out with staggering figures regarding the levels of Poverty in Iraq. As you may know, there are roughly two types of poverty indexes - absolute and relative. The agreed upon definitions for these 2 types by economists are 1) absolute poverty is when someone lives on less than 2$ per day. 2) the relative poverty index on the other hand is calculated per indicators of wealth distribution and inequities in wealth distribution coupled with other indicators such as inflation, employment levels, etc... I will not dwell on the evaluation procedures here...just to give you an indication of a rough definition of what constitutes poverty. Having said that, this latest academic publication from the University of Babel, states that 10 Million Iraqis live in ABSOLUTE poverty since 2003. The bulk of which is among youth - i.e population below the age of 30, i.e the segment of a population considered to belong to the most productive age group, all things being equal. 10 Million Iraqis represent roughly over 30% of the total population. 2) FAILURE of all reconstruction efforts, i.e the possibility of creating employment through projects. 5) A consequence of privatization is heavy reliance on IMPORTS of goods which in turns means the strangling of LOCAL manufacturing, which in turns leads to closure of these enterprises. 6) Furthermore, the endemic corruption of the majority --- sectarian Shiite, Kurdish, puppet government, the exorbitant salaries and fringe benefits of the puppet members of parliament, parties and militias have greatly contributed to an inequity of wealth distribution coupled with a massive mismanagement of the country resources, have led to an inflation rate that in turn feeds into the vicious cycle of poverty. 7) Unemployment rate is around 50% (the official figure is 30%), with no possibility of finding work due to all the above points, swells up the absolute poverty figure and Iraqi economists are expecting this trend to RISE in the coming years. 8) Another factor to consider is the total absence since 2003 of social institutions and insurance/pension schemes that used to guarantee a minimum wage for those without work. 9) Something not to lose sight of, is that the above developments took root in an already vulnerable terrain.. superimposing themselves on a society that was already massacred by 13 years of sanctions, of an embargo imposed by the civilized West. Reminder: Iraq is the second biggest oil reserve in the world. Oh God, what have you done to Iraq YOU BASTARDS. What have you done to Iraq ! !